Now is the time when millions of families across the country are starting to plan getaways for spring break, summer vacation and long holiday weekends throughout the year. 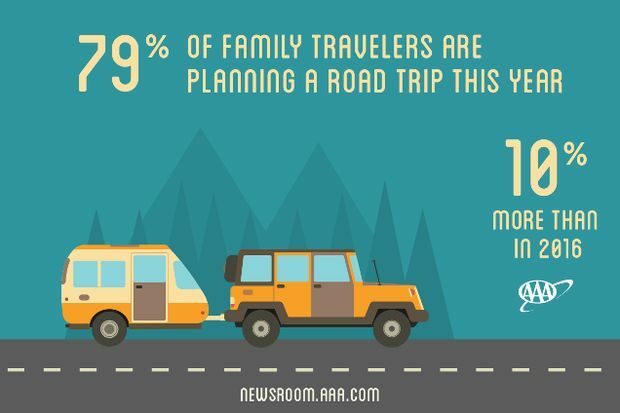 According to a recent AAA survey, more than one-third of Americans (35 percent) are planning to take a vacation of 50 miles or more away from home involving two or more immediate family members this year. The overall volume of travelers remains unchanged from last year, indicating that Americans continue to prioritize traveling as a family. While most families (70 percent) are planning to take one or two vacations, there is a significant increase this year in the number of Americans who say they are planning to take three or more vacations. The 28 percent of Americans who will take three or more family vacations this year is 13 percent higher than in 2016. Those planning to pack up their cars for a road trip this year will be in good company. Compared to 2016, 10 percent more families are expected to take road trips this year, despite average gas prices that are 47 cents higher than they were this time last year.